Anyone can use one hand to find the other. If your reason for doing this involves changing magazines, either while focusing on a target, or returning fire, the task becomes daunting. This is because it isn’t always easy to stuff a rectangular box into a rectangular space, the normal conformation of most pistol magazines and magwells. 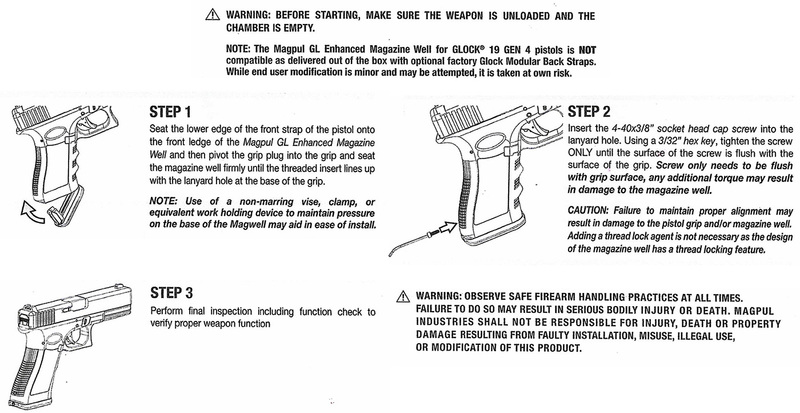 Magpul Industries offers a solution for the Glock magazine/magwell configuration. The Magpul Glock magwell extension adds an improved flare to the stock Glock magwell. It allows a fresh mag to be smoothly slammed home, even from weird angles. Between the various iterations of Glock magazine, there are some differences in floor plates. Magpul has this covered with an extension that handles these differences, from Glock 19 and Glock 17 through most of Glocks long list of models. The well-executed design also adds little to the Glock’s classic shape. There are expensive, metal, alternatives to Magpul's design. However, metal adds weight without offering tangible improvement. In contrast, the Magpul Glock Magwell extension is constructed from durable, reinforced polymer. You won’t notice the added weight. You also won’t experience problems when dropping a magazine. The smooth, flared design of the extension makes magazine changes less daunting and potentially much faster. In addition to the Glock 19 and Glock 17, These Magpul magwell extensions will fit other models of the Glock. This Magpul GL Enhance Magwell is a nice upgrade for Glock pistols, and it will do the job you want it to.